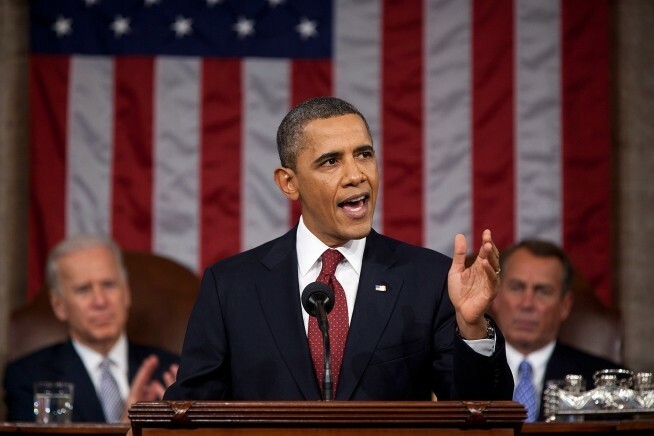 President Barack Obama delivers the 2012 State of the Union address. When President Obama delivers his State of the Union address Tuesday night, he's expected to call on Congress — and the states — to guarantee workers up to seven days of paid sick leave each year. That has advocates in Vermont hoping the president's push will provide momentum for a long-stalled state initiative. "I'm optimistic that this will help us get it over the finish line," says Lindsay DesLauriers, director of Main Street Alliance of Vermont. Last year, DesLauriers — then a lobbyist for the nonprofit Voices for Vermont's Children — waged a high-profile campaign to mandate paid sick leave in Vermont. Legislation introduced last January would have required employers to provide up to 56 hours of accrued time off for those who are ill, taking care of a family member, or recovering from domestic or sexual violence. But the bill died halfway through the legislative session, following serious pushback from Vermont's business community, when House Speaker Shap Smith (D-Morristown) said his caucus was not unified behind the issue — and Gov. Peter Shumlin said he'd prefer to raise the minimum wage. In his State of the Union address, Obama is expected to call for a national paid sick leave policy — but in an implicit acknowledgement of Republican resistance to the idea, he is also expected to encourage states to go their own way. According to a fact sheet released by the White House last week, the president plans to devote $1 million to "to help states and municipalities conduct feasibility studies" of such policies and will request another $2 billion to support state efforts to implement them. So will Obama's rhetoric move the needle in Vermont? "I think it's too soon to say," says Rep. Sarah Copeland Hanzas (D-Bradford), who was elected House majority leader late last year. "The fact that the president is giving it a little nudge will certainly help [advocates] in their efforts." As owner of the Local Buzz cafe in Bradford, Copeland Hanzas says she sympathizes with arguments made by both sides in the debate. "It would become a bit of a challenge for the very smallest employers, because if you only have four folks on staff — and, as in my case, they're all working moms — it becomes hard for people to cover for one another," she says. "On the other hand, I'm in the food service business, so I don't want people to come to work when they're sick." She adds, "So I'm caught squarely in the middle. I feel both sides." DesLauriers says she and her allies have been spending time meeting with legislators and business owners to understand those and other concerns. Last week, Sen. Phil Baruth (D-Chittenden) introduced a new version of the bill addressing an issue raised by many critics: that part-time, seasonal workers — such as high school students working at a grocery store — would take advantage of the provision. Baruth's bill requires employees to work 500 hours before tapping into accrued time off. DesLauriers says supporters in the House are still drafting their version. "We're doing a lot of work right now with lawmakers to understand what they'd like to see in it," she says. "We want to come at it with a freshness. We're not just pushing the same bill forward again." Scott Coriell, Shumlin's spokesman, did not respond to requests for comment on whether the governor will support the initiative this year.